Anaphorathe repetition of a word or phraseis a strategy that assists coherence, and draws attention to the repeated terms. In Eucharistic settings, it also indicates the specific liturgical moment when the bread and wine are consecrated, becoming what we in the Eastern Church are pleased to name the Holy Mysteries. Certain poems in this collection employ overt anaphora; many do not. Still, they invite a sense of words as doing more than naming, more than serving as arrows pointing to prior substance; intermittently, these words may acquire due substance of their own, partaking of more than is apparent, but is nonetheless so, and is present. Librettist, essayist, translator, and author of nine poetry collections, Scott Cairns is Professor of English and Director of the Low-Residency MFA Program at Seattle Pacific University. His poems and essays have appeared in Poetry, Image, Paris Review, The Atlantic Monthly, The New Republic, etc., and both have been anthologized in multiple editions of Best American Spiritual Writing. He blogs for the Religion Section of The Huffington Post. His recent books include Slow Pilgrim: The Collected Poems (2015), Idiot Psalms (2014), Endless Life (translations and adaptations of Christian mystics, 2014), and a book-length essay, The End of Suffering (2009). His spiritual memoir, Short Trip to the Edge, recently has been translated into Greek and Romanian. He received a Guggenheim Fellowship in 2006, and the Denise Levertov Award in 2014. His new projects include Descent to the Heart, verse adaptations of selections from the writings of Saint Isaak of Syria, and a new poetry collection, Late Testament. 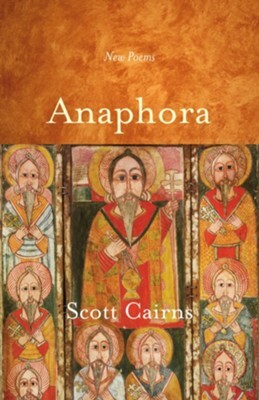 I'm the author/artist and I want to review Anaphora: New Poems.